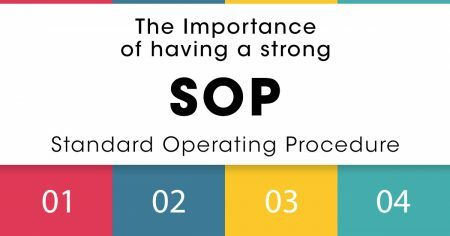 Every company needs a strong standard operating procedure (SOP). You may not apply it to every job function but it will make everything work more smoothly. A SOP will help each staff member have a clear picture of how things flow through and take the guess work out of their daily job duties. This will also help them improve and hone their job skills and performance. As a company grows, a finely tuned SOP will allow you to replicate and scale quickly, but when downsizing is necessary it will also help you identify where to cut. In a multi-location operation, a strong SOP will determine the success of the business. An example is when a team member takes a long vacation. The person filling in should know exactly what to do if the SOP is clear. A strong SOP allows managers to easily redistribute workload and gets the staff to be up to speed quickly with a consistent end result. Creating a strong SOP requires strong common sense, logic, and understanding of each job function and teamwork. Communication and support is key. Motivate your team to speak up when a problem arises and make it your mission to solve their problems. Stay focused on the goal and continue to fine-tune through trial and error. Our brain juice should be saved for creativity and facing new challenges not guessing what is going on. For information on how we can apply our standard operating procedure to ensure timely delivery on your project, contact us or give us a call at 626.400.4511!